So, we don't UNDERSTAND nuclear and our little waste problem. This condescending, ridiculous bantor from the industry nver ceases to amaze me. 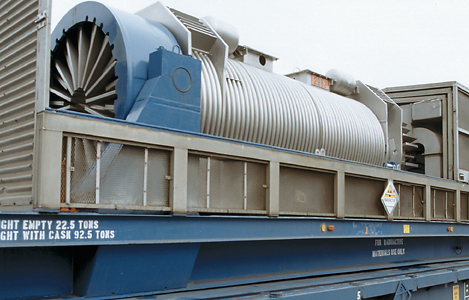 The industry's problem is that more people are beginning to understand the dangers of nuclear. The lifespan and inability to rid ourselves of it was reason enough to have never began this horrid mess. Indeed, I DO understand and, therefore,I want this needless perpetuation of nuclear to end! My reaction to the first of the above was almost to say aloud in Morbo fashion (from Futurama, to the uninitiated), "Windmills do not work that way!" In other words, it conveys a serious lack of understanding about just how radiation works. To explain it briefly - ionizing radiation (i.e., the kind that can cause health problems) doesn't just blow around like dust in the wind - it comes from a source: like the atoms decaying inside nuclear fuel, or the sun for instance. (Yes, the sun - ever wonder why you get a sunburn from staying out in the sun too long? You just got a very mild radiation burn.) For gamma radiation, (i.e., energy emitted from nuclear transitions, ranging from ultraviolet rays to x-rays to gamma rays), this travels in a straight line, just like visible light - because it is light; it doesn't simply scatter to the wind. Further, it attenuates strongly as a function of both distance and shielding; fuel transport casks are designed such that a person standing directly next to the cask would have to stand there for any awfully long time to get anything approaching a dangerous level of radiation exposure, but further, gamma radiation attenuates as the square of the distance. In other words, for every factor of 10 one moves away from a radiation source, the exposure drops by a factor of 100. But getting back to the issue at hand - yes, casks are air-cooled, but so what? For radiation to "move freely" as the commenter describes, this would require radioactive material to move freely. Yet the transportation casks are clearly designed such that heat from the fuel is conducted to the outside of the cask, where it is carried away by convection. In no way does the fuel get exposed to air, the only plausible way in which this event could happen (i.e., particles of the fuel itself allowed to be picked up into the air and carried away). To further put this myth to rest, these same casks have to be tested against all kinds of conceivable accident scenarios - drops, fires, punctures, crushes - anything that the fuel container could possibly experience in an accident condition. 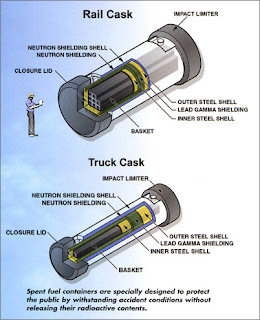 Basically, any cask which is certified to transport used nuclear fuel must go through a battery of punishing tests before it is ever licensed to transport fuel. Therefore, technical experts in nuclear are untrustworthy. Hence we get have people resorting to "folk science" (in other words, lies) peddled by hucksters with their own agendas - be they political or economic in nature. (One can already begin to see the irony forming here.) Or you get the "proud ignorance" - "I don't need to know anything to know this is dangerous and you're lying to me!" How do we get around this? I confess that I'm not an expert in this realm (I mean, after all, my first thought reading the above comments was to simply apply palm to face and mutter, "Windmills do not work that way!") But it does seem like there is a strong need to present a human element to this, conveying above all else that we, too share their (valid) concerns over the health and safety of our respective loved ones, and as such we have the utmost interest in obtaining and conveying accurate information. Of course, a lot of us do this already - sometimes on a daily basis. A large part of the problem seems like an inability to penetrate "hardened" ideological structures where such ideas are formed and reinforced. And certainly, this applies far more broadly than just nuclear technology - think global warming, for example - a near-mirror image of this same phenomenon can be observed (accusations of science being manipulated for economic and political interests, etc.) If anything then, this seems to speak of a larger societal problem in conveying scientific and technical information about risk to the public. Just wait till Nuclear improves (*cough* Thorium/LFTR *cough*) to the point where it is being deployed. Then the two memes will converge: Global Warming is a plot by the Nuclear industry to do whatever it is that the conspiracy theory crowd imagines. One of the reasons I was skeptical about AGW for a very long time is because of all the lying that the Greens have systematically engaged in about nuclear power for 40 years. If they'll lie for forty years, as an organization, about nuclear power, and the media will swallow it, why should anyone believe them about AGW? Why does Rep. Markey oppose natural gas exports?